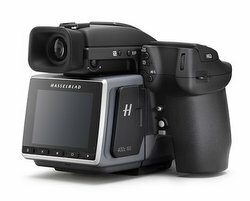 Hasselblad has announced the H6D 400c MS, a 100-megapixel medium format camera that can capture massive 400-megapixel stills with sensor shift technology. Sensor shift is being called multi-shot, and can shoot either four or six exposures. The six exposures individually capture red, blue and green colour information by moving the sensor one, and then a half pixel both vertically and horizontally, via a piezo unit. Specifically, the first four images move one pixel at a time, and the next two move half a pixel upwards and horizontally. The end results is a 16-bit TIFF file weighing a mind-blowing 2.4GB. Few photographers need to work with such massive resolution. Hasselblad designed the mammoth medium format camera with art reproduction and cultural heritage documentation in mind. Cultural institutions, such as museums or libraries, may find capturing the most intricate details of historic items valuable. The remaining question is: can Lightroom or any post-processing software handle such huge files? When not using Multi Shot, the camera is just an ‘ordinary’ H6D-100c, released in 2016. This entry was posted in Deck left, New Products by Keith Shipton. Bookmark the permalink.